The U.S. Border Patrol Agency has been ordered to “give up its guns”, starting this summer. In a surprise directive issued this morning, the Department of Homeland Security (DHS), parent agency of the Border Patrol, announced that up to one-half of U.S. Border Patrol Agents will be required to turn in their firearms, starting August 1, 2011. 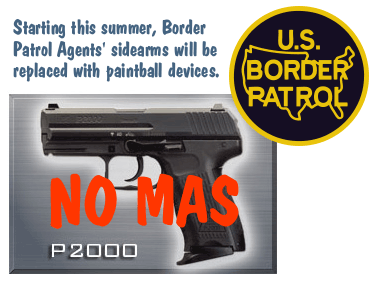 The current issue sidearm of the Border Patrol is the HK P2000 LEM in .40 SW, but Agents many also carry rifles and shotguns. Duty Weapons will be replaced by non-lethal dye markers, similar to paintball guns. Speaking at a Washington, DC press conference, Homeland Security Director Janet Napolitano stated that stripping the Border Patrol of lethal weapons reflects the “long-stated objective of this Adminstration to value human life over all other lesser considerations.” Napolitano stressed that the Border Patrol would not be required to give up all its firearms. The Patrol would still maintain pistols, rifles, and shotguns in “secure lock-ups” removed from the “immediate border area”. The goal of the policy shift, Napolitano stated, is to eliminate the risk of accidental or unintentional injury to “wayward travelers and undocumented citizens”. 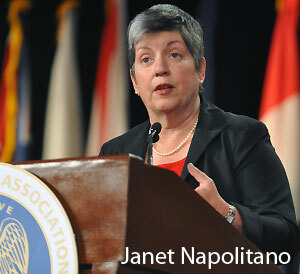 Napolitano denied that confiscation of Border Patrol Agents’ firearms was a response to “trigger-happy men in green”. Napolitano stated: “I have the greatest faith in our men and women in the Border force”, adding that “we are now giving those Agents viable non-lethal technologies with which they can carry out their duties”. 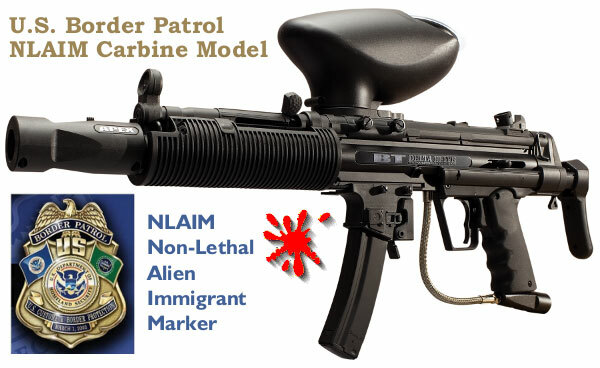 The technologies cited by Director Napolitano include the new Non-Lethal Alien Immigrant Marker (NLAIM) which will be provided to Border Patrol agents on the “front line”, i.e. those who actively patrol the southern border. The NLAIM is a pneumatic device that propels small, liquid-filled marker balls at effective ranges up to 50 feet. Once released, the liquid inside the balls leaves a highly-visible, long-lasting dye mark on anything it contacts. In addition, the dye marker solution is activated by body heat so it literally “glows in the dark” when viewed through night-vision optics. Is NLAIM Technology Really Something New? Critics of NLAIM technology claim that NLAIM devices are merely over-priced versions of recreational paintball guns, many of which sell for under $200.00. NLAIMs, which will be provided in both pistol and carbine configurations, cost nearly $2700.00 each, not including transport modules. A total of 10,000 NLAIMs will be delivered to the Border Patrol under a no-bid DHS contract valued at $26.8 million dollars. Some of that cost will be offset by revenues earned from the recycling of current Border Patrol firearms which will be decommissioned, melted down, and sold for scrap. The United States Border Patrol is a federal law enforcement agency within U.S. Customs and Border Protection (CBP), a component of the Department of Homeland Security (DHS). Currently, the U.S. Border Patrol employs over 20,200 agents, who are specifically responsible for patrolling the 6,000 miles of Mexican and Canadian international land borders. 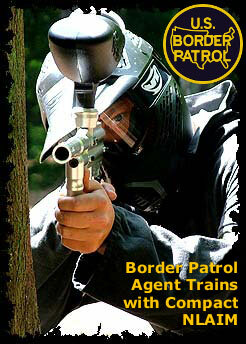 Agents are assigned primarily to the Mexico–United States border. There are 20 Border Patrol sectors, each headed by a Sector Chief Patrol Agent. Currently, U.S. Customs and Border Protection has more sworn law enforcement officers than any other agency in the U.S. Federal government. Share the post "U.S. Border Patrol Replaces Guns with NLAIM Paint Markers"
A recent scientific discovery in Washington State suggests that North America once harbored large colonies of giant, man-sized rodents — distant cousins to today’s prairie dogs. Earlier this month, while searching for dinosaur fossils, a field team of Yale University paleontologists uncovered a startling find — the skull of a massive prehistoric rodent, along with other skeletal remains. The skull, nearly the size of a horse’s head, is almost identical in form to the skull of a modern-era prairie dog, though it is is more than 50 times as large. 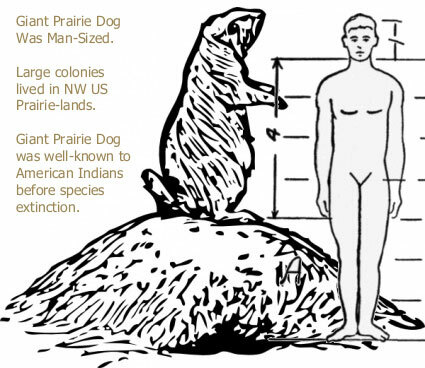 Apparently today’s Black-Tailed Prairie Dogs had some very large predecessors. Based on the size of the skull and other bones, scientists estimate that the giant prairie dogs could stand up to 7′ tall and weigh up to 350 pounds. In other words, this critter was man-sized. The giant rodents lived much like modern prairie dogs do today — grazing on vegetation and nesting underground in burrows. The giant skull was unearthed in Washington’s Mima Mounds Natural Area Preserve. View More: Mima Mounds Aerial photo. Southwest of Seattle, near Littlerock, Washington, you’ll find the Mima Mounds, a vast field of clustered earthen mounds covering over 600 acres. Since their discovery (by whites) in the 18th century, the Mima Mounds have confounded scientific explanation — until now that is. 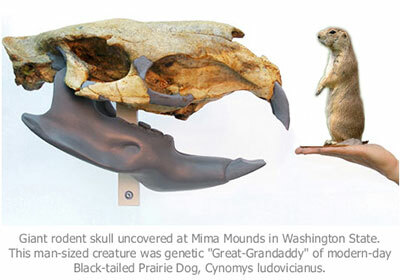 The location of the giant prairie dog skull and bones inside one of the Mima Mounds indicates, with great certainty, that the mound field was created by a large colony of giant burrowing rodents. 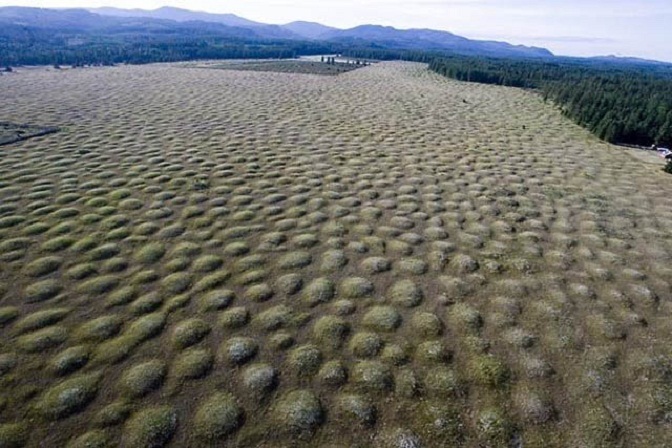 Scientists now believe that the Mima Mounds area is a prehistoric prairie dog field, created by the creatures scientists have nicknamed “Big Dogs”. The presence of the giant prairie dogs at Mima Mounds is confirmed by Northwestern Indian legends describing a giant burrowing beast that stood as tall as a man, when raised on its hind legs. Researchers, who transcribed oral histories of the Sauk-Suiattle tribe, have recorded numerous references to a large, man-sized creature that burrowed underground. In the Suiattle language the beast was called “Chok-lahtle-wachook”, which, literally translated, means “Standing Man-Mouse”. A number of ancient Indian carvings and artifacts have depicted this creature (see photo at right), but cultural historians had not understood their significance. 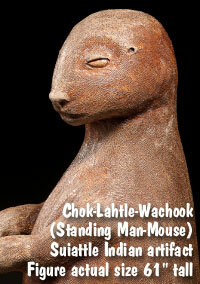 For decades the historians presumed Chok-lahtle-wachook was a wholly fictional man-beast, not a real species. Such mythical hybrid creatures are commonly revered as important totemic spirits by many Native American cultures. However, it now appears that Chok-lahtle-wachook really existed, and did so in great numbers. Can Science Revive the Giant Prairie Dog? Share the post "Yale Scientists Discover Prehistoric Man-Sized Prairie Dog"
The Editors of AccurateShooter.com and a pantheon of legendary shooters have collaborated on a new book, Voodoo Accuracy, destined to become the definitive print resource for precision shooting. This new 666-page, full-color treatise compiles the wisdom of today’s greatest Hall of Fame and National Champion shooters. With the Voodoo knowledge of the world’s ‘top guns’ in your grasp, you can and will shoot more accurately no matter what your discipline. Why do Voodoo? Sure you can spend hours, days, months, heck even a lifetime measuring stuff with calipers and trickling individual powder kernels, but you’re not going to win the big matches without access to the closely-guarded Voodoo secrets of the world’s master marksmen. Remember, there are more things in heaven and earth, Horatio, than are dreamt of in your reloading manuals! For the first time ever, Voodoo Accuracy reveals the hidden shooting secrets of the greatest trigger-pullers of all time. Now you too can shoot like a legend! Find out how to win matches without ever practicing! Apply Voodoo reloading techniques with startling results! Voodoo Accuracy contains chapters on all major forms of competitive shooting, from 25m air rifle benchrest to ultra-long range tactical competitions. Whatever your sport — point-blank benchrest, High Power, F-class, Silhouette, Palma, Multi-Gun, Biathlon, 1000-yard Benchrest — you’ll find invaluable Voodoo insights that will transform your shooting abilities overnight. We guarantee it! ● Extreme Wind Calling — How to dope a hurricane. ● Barrel Break-In — Sure-fire 50-step, 1000-round method. ● Ogive Talkin’ — More incomprehensible Ballistology by Bryan Litz. ● Point-Blank Pointers — Feng Shui and the placement of Wind Flags. ● Why Weigh Charges? — How to throw perfect charges blind-folded. ● Powder Blending Basics — Have a BLAST with the Mix-Master method. ● For FTR, Size Matters — Six-foot-wide, servo-adjusting bipods by Danny Biggs. ● Hall of Fame Headgear — The effect of dorky hats on Group Size, by Tony Boyer. ● Barrel Tuning — Voodoo Methods demonstrated (results guaranteed non-repeatable). ● Tactical Gearfinder — Be the first on your block with the latest, overpriced Tacticool accessories. ● .30-06 — THE solution to everything, including the economy and Global Warming, by G. Salazar. ● Voodoo Annealing — How to anneal by instinct (worrying about time and temperature is for sissies). 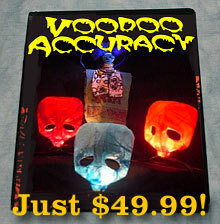 Voodoo Accuracy comes in a handsome, large-format hardback edition for $49.99. There is also a special, limited-run letterbox edition signed by Hall of Famers so legendary we can’t even mention their names here. The letterbox edition, limited to 250 copies, will cost $299.99. Think that’s too much? Well who can put a price on perfection? We guarantee that if you buy Voodoo Accuracy you’ll win early and often, feeding your self-esteem while reducing your shooting rivals to whimpering, broken shells of their former selves. Remember, as Charlie Sheen said, it’s all about “Winning”! If you want to run with the Big Dogs, and strut your stuff on top of the podium, order your copy of Voodoo Accuracy today! 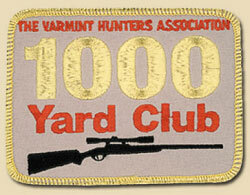 Share the post "AccurateShooter.com Releases Definitive Precision Shooting Book"